I thought you might like to know about the balloon's journey. I picked it up in Glebe and then walked it through Wentworth Park and Ultimo until we got to Broadway. There we boarded a bus which took us down George Street (this is the main street in Sydney's CBD) to Circular Quay (home of the Opera House and Harbour Bridge). We boarded a ferry and sailed through the harbour, I attempted to get a few shots here in front of the landmarks but between the wind, a large cruise liner and a few inconsiderate tourists the ideal snap was sadly not to be. But I can assure you the balloon went past them! A 30min ferry ride later we were at Manly. I chose this location because friends had told me it was the lovliest ferry journey and beach in Sydney. It was my first visit and I have to say I agree, it is just lovely. I took a bunch of photos on the beach and jetty and then let the balloon go. I watched it fly really high and off into the distance. It seemed to be heading back towards Sydney, so I imagine it flew over the city centre and then eventually out to sea. 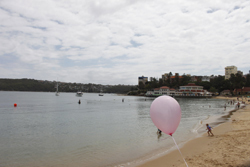 I attracted a little bit of attention with my large pink balloon on a ferry full of children (school holidays here) an one little girl really took an interest. I got chatting to her and her mum. I told them that any other day the balloon could have gone home with her, but that today it was ear marked for a special little girl who was waiting for it. My cousin always tells me that a white feather means angel wings and that someone who has passed was there with you. As I was leaving the jetty after letting the balloon go I saw a white feather on the step right behind me. I took a photo and have sent you that too.